Pool construction has come a long way in terms of methods and materials. Almost all in ground pools installed today are made from a material known as gunite. While the name describes the material used for the pool, it is also used as a blanket term for the overall method. How it became so popular has to do with the failings of the methods that came before, and the advances of certain technology. Here we give a short history of how gunite pools became the go-to for pool installation companies. The traditional method of building an in ground pool consisted of pouring liquid concrete into a wooden framework. After the frame in formed and laid into the ground concrete is pour first on the outside of the frame and then inside the frame to form the bottom and sides of the pool’s basin. The concrete was then covered with vinyl before being filled. This type of in ground pool is very similar to a poured concrete pool in that after the frame is set up, concrete is poured into form the basin of the pool. Instead of wood, however, masonry block pools use concrete blocks for the frame. 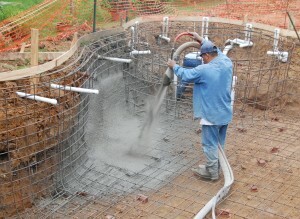 A main distinction between a gunite pool and other styles is the framework used to hold the shape of the pool. Gunite pools use a framework grid made from rebar that is then sprayed with the actual gunite, which is a mixture of cement, sand, and water that is combined just before spraying. Since gunite is so durable and rebar easily bent these pools can be made in a huge variety of shapes. This entry was posted on Friday, August 26th, 2016 at 10:07 am. Both comments and pings are currently closed.